The National Museum of American History is committed to exploring the legacy of American cinema as well as how film culture shapes how we perceive ourselves as Americans. 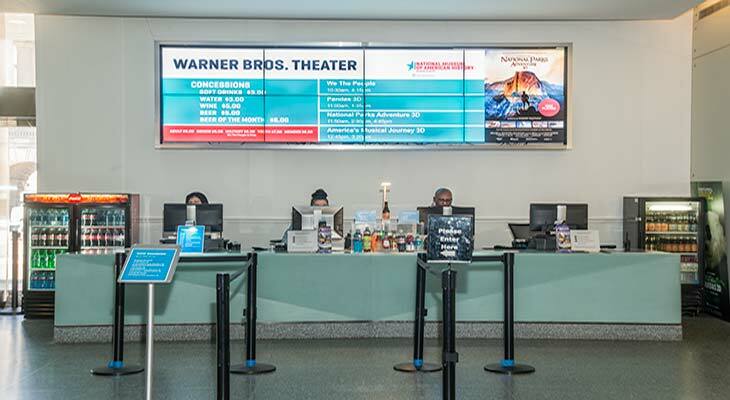 The Warner Bros. Theater provides visitors with new and exciting opportunities to explore the art of film in a stunning and intimate 261-seat jewel box venue using state-of-the-art digital 2D & 3D and 35mm film presentations. This theater hosts a full roster of public programs, from new and repertory film screenings, symposia, lectures, and concerts, to expansive film festivals. America’s Musical Journey celebrates the unique diversity of cultures and the creative risk-taking that characterize America, as told through the story of its music. MacGillivray Freeman's National Parks Adventure takes you on the ultimate off-trail adventure into the nation's awe-inspiring great outdoors and untamed wilderness. Pandas are beloved around the world, and now they are coming to the screen in the original film Pandas, a breathtaking documentary adventure and amazing experience for the whole family. Using a fleet of specialized vehicles, two missions are launched to capture the birth of a tornado.